TMZ SPORTS -- Gennady Golovkin's camp is coming out swingin' at Canelo Alvarez -- aka CCC -- "Canelo Con Carne." Yeah, it's a shot at the boxer's positive PED test, which Canelo blamed on tainted beef he ate in Mexico. 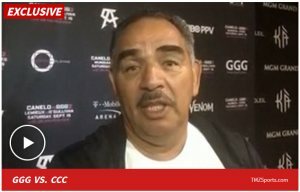 GGG's famous trainer, Abel Sanchez, ain't buyin' Canelo's excuse -- telling us straight-up the guy's a cheater who's a disgrace to the sport of boxing. "He did some things that were insulting," Sanchez says ... "insulting not only to the sport, to the fans." "We feel that an athlete at that level has got to be more cognizant of what is allowed and not allowed and for him to make the excuse that he made I think that it's insulting." Sanchez says Gennady is also very insulted -- and plans to exact his revenge when the two clash in Vegas on Sept. 15. "I think that if Canelo is true to his word that I think this fight ends somewhere after the 10th, when Golovkin has dropped him once or hurt him a couple of times."